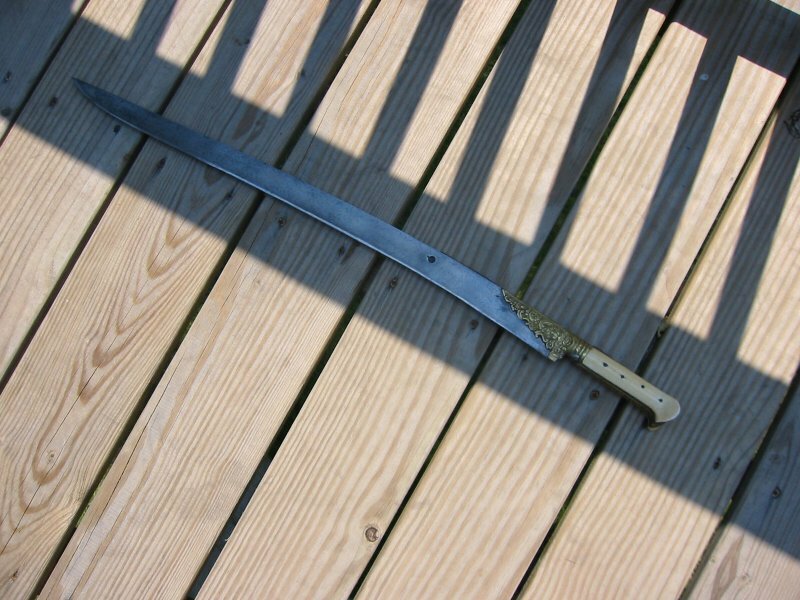 I no longer own this but it's a one-of-a-kind Chinese piandao (slashing saber) I commissioned from John Lundemo. here is a pivture of a custom colored VA Warder. Maybe not as curved as some. It seems more curved in the hand. Some of the blade appear to be straight in the photos, but they do have slight curves! English hanger c.1750, with antler grip and shell guard. British hanger c.1790, with slot hilt and lion head pommel. 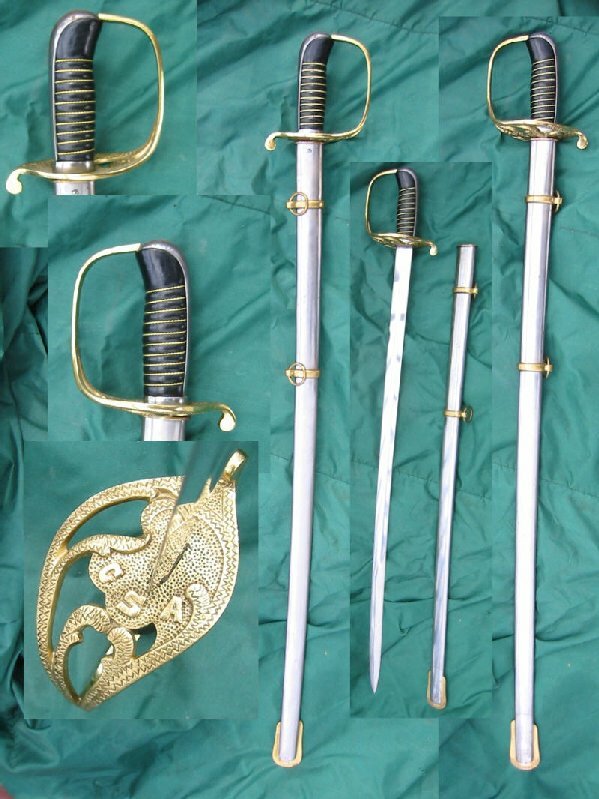 British Pattern 1796 Light Cavalry Officer's Sword c.1796-1808, sold by J.J. Runkel. British Pattern 1796 Light Cavalry Officer's Sword c.1814-1820, with sharpened pipe back blade and beak pommel. British Pattern 1803 Infantry Officer's Sword c.1803-1816, with slot hilt, lion pommel, and profusely etched blade. British Pattern 1821 Royal Artillery Officer's Sword c.1860-70 by Philips & Sons, blade in original polish. British Pattern 1827 Rifle Officer's Sword made in 1866 by Wilkinson, sharpened blade in original polish. British Pattern 1845 Infantry Officer's Sword c.1845-54, retailed by Millan & Mann of Edinburgh. 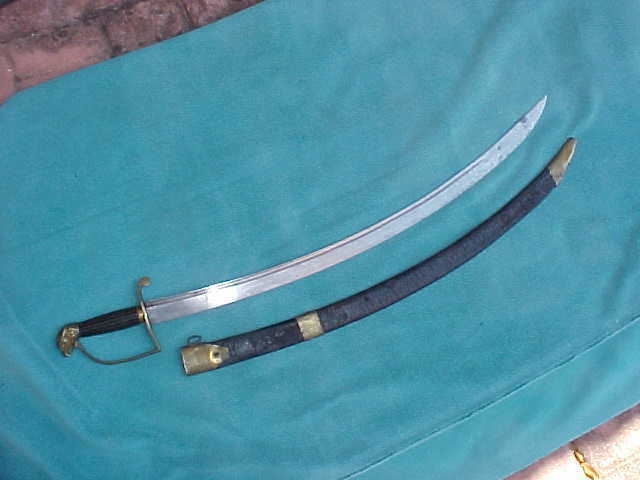 British non-regulation sword for a cavalry officer made by Wilkinson in 1865, with steel scroll hilt and sharpened blade. 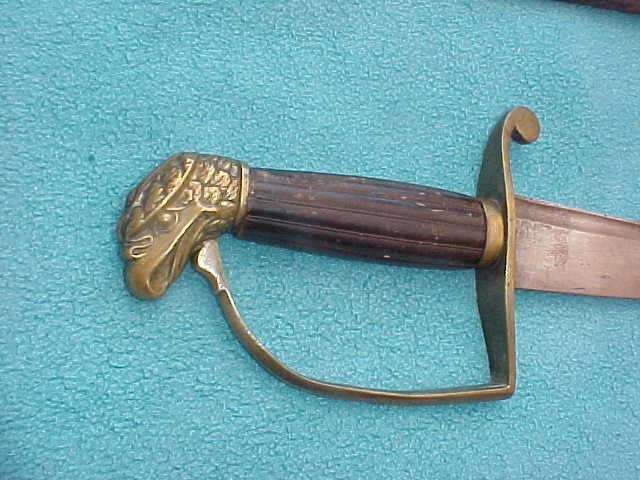 British Pattern 1854/95 Infantry Officer's Sword made by Wilkinson in 1876, with sharpened P1845/54 style "Wilkinson" blade and P1895 hilt. I've owned many other curved blades that are now featured in the retired items of my collection gallery. I love your swords, Jonathan - Nathan's as well. The only curved blade I possess is an ATrim Tactical Cuttoe - not much on looks, but a lot on function. This is the only curved sword in my collection. I don't have good pictures of many curvies here and no group of the odd pile. I'll attach one that goes the wrong way and a recent cousin come to stay. If I am counting right and the wrong way example, it rounds out to a dozen. Also attached here are a reproduction cutlass and an India special foot officer piece. aaahh, so at least we know who owns potter`s fledermaus. This was my second commision from Ben. I also have Steel Tooth the broke back seax displayed on his website. he is currently making another seax for me. i will be giving this one as a wedding gift to my little brother. Ben is a true artist and exceptional craftsman. Thanks, Roger! The cuttoe blade actually looks a bit 19th century. 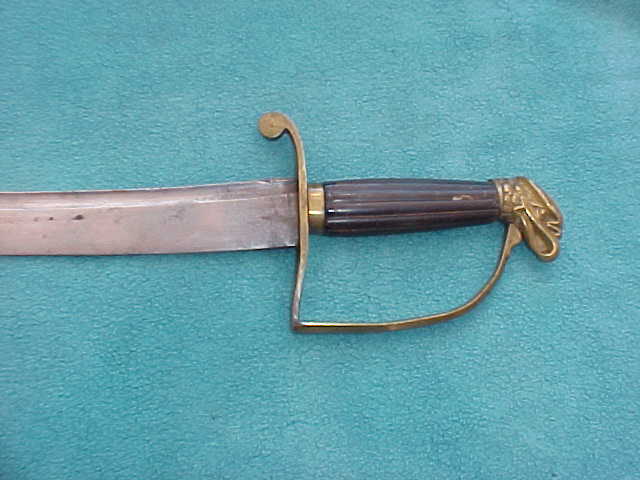 Italian Bersaglieri yataghan bayonet, dated 1851 (a rare bayonet). French M1866 yataghan bayonet for the Chassepot rifle, made at St. Etienne in 1873. Old Tulwar hilted Kora with the remnants of applied silver decoration on the grip. It probably originates from Bengal, North East India. Very nice, Norman! Do you focus on Indo-Persian arms? I'd love to acquire a tulwar c.1840-1860 at some point. Glad you like it and yes indeed Indo-Persian is my favourite and main sphere of collecting. This area has a very diverse selection of weaponry along with numerous choices from munition grade to the sublime, something for everyone. Of course you will know of the 'possible' connection between the Tulwar and the 1796 L.C. sabre, Le Marchant was supposedly influenced by the large curved blades found in India, yet to be proved or otherwise as far as I'm aware. I'll post a couple of mine here, need to take photographs, that fall within the time period you mentioned. A good quality Tulwar is not as inexpensive as was these days but I reckon you can still pick up a nice quality fighting example for the price of an average Victorian sword. Love the hangar BTW. I can say with 100% honesty that I am totally green with envy. 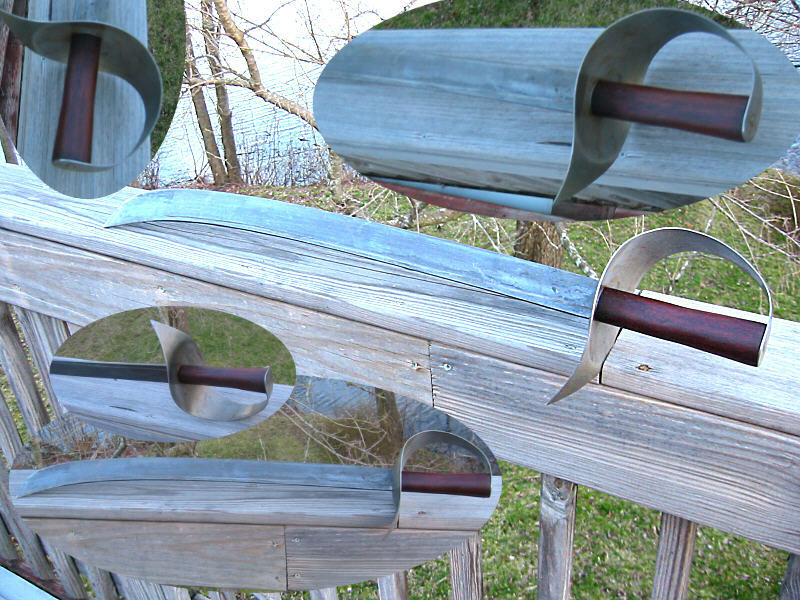 These curved swords are all positively beautiful! I still say that there's no better way to SEE history than looking at the time period's weapons. I'm also in awe with how well preserved these pieces are. Very, VERY well preserved. 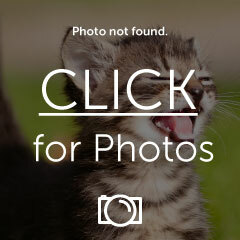 Thanks for sharing your photographs, guys! That was a real treat for me! Excellent, Norman. I can't wait to see more of your collection!